The fresh ingredients and variety of flavors in this salad make it a meal you'll want to have over and over. Not only is this a colorful dish, it's packed with healthy nutrients like monounsaturated fats, vitamin C, antioxidants, and potassium. Your taste buds will have a party and your body will thank you for the healthy choice you made with this recipe! 1. Sauté shrimp in a pan with the olive oil and garlic until pink. Remove from heat and season with salt. 2. 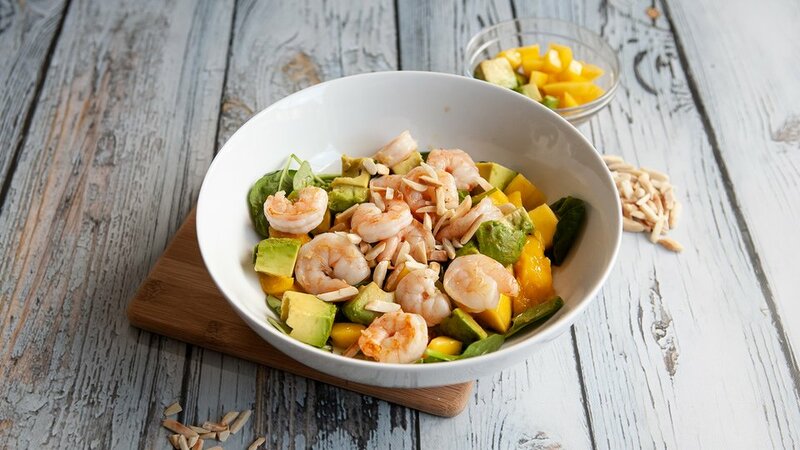 Put spinach, mango, and avocado together in a large bowl. Add the shrimp. 3. In a small bowl, mix the olive oil, lemon juice, and liquid aminos together for the dressing. 4. Pour the dressing over the salad and serve!